The value of the world’s top B2B brands has grown by more than a quarter, according to the latest annual ranking by BrandZ. Last year the top 20 brands grew by 11%, and a year prior the brand value actually declined by 5%. Half of the brands in the top 20 are tech companies, and this rapid growth was attributed to the shift from traditional to cloud-based services. Microsoft retained its position at the top of the B2B ranking, increasing its brand value by 40% in the past 12 months to $201 billion. IBM’s value declined by 6%, but remained in second place. Financial services provider Wells Fargo leapt two places to third thanks to a 4% increase in its brand value. 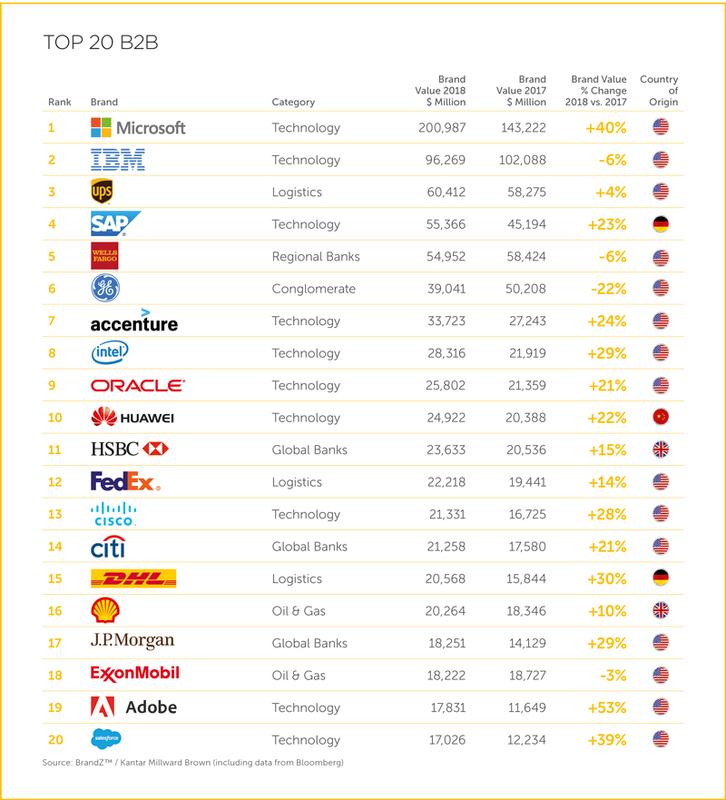 Adobe and Salesforce were the only two new brands to enter the top 20, replacing Hewlett Packard Enterprise and Siemens in 19th and 20th places respectively. Adobe was the biggest riser, increasing brand value by 53%, and Salesforce demonstrated an impressive 39% leap in value. According to the BrandZ Top 100 Most Valuable Brands study, total brand value increased by 21% to reach 4.4 trillion. BrandZ defines a B2B brand as one that generates more than half its revenue from business clients.